It's almost Thanksgiving, the one time during the year when we all give thanks for not being born turkeys. It's a day of parades, football games, big meals, family get-togethers, and the annual farewell to our month-long guest, the Rockin' Gobbler. The Rockin' Gobbler has been staying at our home ever since the cauldron frogs disappeared after Halloween. By most measures, the Gobbler has been an unobtrusive guest, since he hasn't hogged the TV remote or left an empty roll of toilet paper in the bathroom without telling us. Still, I can't say I will shed a tear once he leaves. It's a true parent's delight, and the kind of gift only a grandparent could give. The thing is, I received this gift from my parents back when I was living in Atlanta, before I was even married. I was working on Thanksgiving, and I guess they felt that, since I couldn't be home for the holiday, a loud, singing, wobbling turkey would be a good substitute for family. Either that, or they were trying to send me a message: "This loud, singing, wobbling turkey will hound you forever because you missed the family Thanksgiving. Don't do it again, Boy." 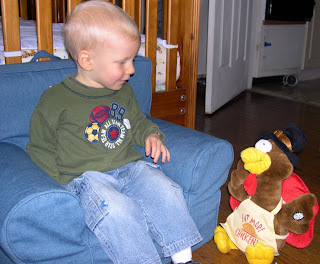 Now that we are able to celebrate the holiday with family, the Rockin' Gobbler has become Kyle's toy. Our son certainly enjoys it. Each morning, instead of giving his parents hugs, the first thing Kyle often does is motion towards the Gobbler, requesting that it be played. When we do play it, much later in the day as to not wake the neighbors, he wants us to play it again and again. By the holiday, my child and our guest certainly will have made a strong bond of friendship. No doubt the Gobbler is part of a decades-old plan to get children to hate Thanksgiving, devised by jealous adults who despise how children seem to find joy in everything life offers. Throughout the month of November, children of all ages are encouraged to love turkeys. They play with turkey stuffed animals. They make turkeys out of construction paper. They watch cartoons featuring happy, dancing turkeys. Some kids even go to turkey farms and meet some of the real-life animals, who have adorable names such as "Pumpkin" and "Marshmallow." It's all part of the plan. By the time Thanksgiving rolls around, children are so in love with turkeys, they never want to part with them. Then when dinner happens, the kids are mortified to discover that the animal they cherish has been slaughtered and cooked, and will be fed to them alongside cranberry sauce shaped like a can. Yet, such is life, and far be it for us to do anything different with Kyle. Heck, if this Rockin' Gobbler thing gets out of hand in future years, with us listening to it non-stop, I might have to find a way to put an end to it by convincing Kyle that our dinner is the Rockin' Gobbler itself. It wouldn't be too difficult: all I would need to do is take it out back, and then return with a ketchup-stained shirt and say, "The deed is done! We're all set for the big meal!" Sure, Kyle would cry and cry, but in the end he would thank me for it... or at least Jennifer would. We're not at that point yet, and the Rockin' Gobbler soon will go to a safe home in storage until next year. On Friday he'll be replaced by a stuffed dog that wags a bell on his tail and barks "Jingle Bells." I just can't wait. Our son likes to play with our garbage. I'm not sure whether I should be concerned about this or not. Maybe he's just figuring out what to do with his life, and perhaps the sanitation department intrigues him right now. He has an odd fascination with dump trucks, and when he's not interested in food he'd rather throw it off his tray instead of donating it to a soup kitchen or food pantry. Sure, at 17 months, our little guy might be a bit young to be making career decisions just yet, but far be it for me to stop him if dealing with garbage becomes a true lifelong dream. Perhaps I should clarify what kind of trash he is playing with, for those of you already in the process of reporting us to the authorities. Kyle is not playing with banana peels or cucumber skins, though I'm not saying he wouldn't do that if given the opportunity, as our child seems to want to get into everything these days. No, the trash Kyle plays with is in a basket under an end table, where we keep much of our paper recycling. You could call it our "clean" trash. It's really nothing more than our old newspapers, magazines, and credit card solicitations, but for Kyle it's more exciting than his toy ball, which flashes lights, plays music, rolls on its own, and gives stock tips. Kyle barely touches that thing. He plays with the recycling every day. The recycling basket fits nicely into Kyle's mission in life, which is to make messy what once was neat. He salivates over things that are organized, waiting for the right moment to get at them. This has been happening for a while now. Months ago, just minutes after his first crawl, he quickly cleared the bottom shelf of our bookcase and removed all the DVDs from the TV stand. They were flung into piles, blocking every imaginable foot path. If he had been strong enough, he probably would have rearranged the furniture, too. So an easy target such as a basket of disposable paper goods was just too tempting to pass up. With great speed, Kyle flings the papers, magazines and circulars in every direction around, occasionally to stop and read one until he realizes he still can't read. Of course, now that he is walking, his basket-clearing endeavors have added risk, since the paper cleared from the basket ends up all over the floor. Kyle has learned that this paper has very little traction. Yet he can't help but gravitate to the area where the most amount of paper is lying on the floor, and he will continue to go there after tripping and falling. Our son is a glutton for punishment. Normally I will put the paper back into the basket shortly after Kyle is done with it, in hopes of protecting the little guy from sliding into our table or the trap door leading to our secret dungeon (don't tell our friends). Lately Kyle, being the nice guy that he is, has started helping me with this process. He will go to each piece of paper he flung haphazardly, pick it up, and then carefully return it to the basket. While we are happy to see him do this, we are a little concerned by his inability to stop. Our child has been known add his own things to the basket: a toy, a book, or even his shoes. Fortunately, I tend to find most things before I dump the basket into the recycling bag on trash night. However, a couple of weeks ago, we did notice there was one sock missing in the laundry pile, and we have yet to find it. Perhaps Kyle recycled it, which means there's a chance that somewhere in New York City, somebody's disposable coffee cup has been scented with the aroma of Kyle's feet. For Kyle, the paper recycling basket truly is the gift that keeps on giving. Considering all the junk mail we will be receiving in the coming weeks, it looks like the little guy will be all set for Christmas. Ten years from now, when we spend our Saturdays driving our son to basketball, soccer, baseball, hockey, football, karate, rowing, kickboxing, bowling, and accordion practice, all between six a.m. and one p.m., we will be able to trace the madness back to one date: November 7, 2009. On that day, Kyle entered the wild world of extracurriculars with his first swim lesson at the YMCA. It was a very exciting day for our young family. I did not expect this to happen so soon. I was three years old when I took my first swim lesson, more than twice Kyle's age. Yet, when we became members of the Y last month, I learned that it offers lessons to kids as young as six months old (this is true). I understand that the Y is also considering an "in utero" class, where instructors teach fetuses how to do the backstroke and scuba dive (sessions will cost $100, plus an additional $7 for the mandatory fetus swim cap). No child is too young to have fun at the Y. So, despite being younger than my camera phone, Kyle fit right in with the crowd at the pool. Saturday's lesson was designed to give children the opportunity to be in a pool, gain confidence to swim, and have lots of fun. Kyle did not seem to have much fun at the first lesson. He cried when he stood several feet from the pool as I put a swim cap on him. He cried when I picked him up and carried him into the pool. He cried when we entered the water. He cried when he saw the other parents with their smiling, happy kids. He cried when I splashed a little water on him. He cried when I tried to give him a float to play with. He cried during the hokey pokey. He cried when we turned ourselves around. He cried when the instructor came over to us and tried to cheer him up. He cried when I moved around the pool to show him how much fun it was. He cried when I pointed to his mommy, who was watching us by the pool's edge. He cried when the instructor told us to lift our children into the air. He cried when I held him up high, as if to say "BEHOLD! The wailing child!" He cried when I put him back in the water. 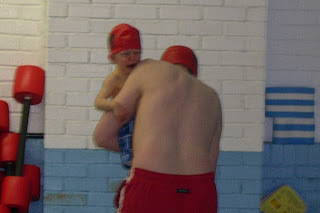 He cried when I started thinking that maybe we had stayed in the pool too long, to a point when others might accuse me of child cruelty. He cried when we left the lesson early to dry off. He cried when I grabbed a towel and took off his swim cap. He cried as I handed him to his mother... and shortly after that, he stopped crying. I could be wrong, but I'm guessing that Kyle did not like his first time in the pool. The other kids in the pool did not cry. I thought that was strange. Surely my child was not the only one with an extreme aversion to chlorinated water. I came to the conclusion that all the other kids were either tadpoles in disguise or mutes. Some time later, though, I learned that there were, in fact, several other kids who did cry. Yet their fathers are compassionate to their children, and didn't force them to go into the water once it became clear they did not want to go. Maybe if Kyle were a little more clear with me, I would have done the same. There's another lesson this coming Saturday, and the Saturday after that. They last through late December, in fact. We still plan to attend all of them, since the first half of the lesson is play time at the gym, which Kyle enjoys. I'm sure he'll eventually learn to love the pool. If not... well, then maybe this won't be the start of extracurricular madness, and perhaps I will be able to sleep in on Saturdays. I might win the lottery, too. Throughout this new parenting experience, there have been many times I have found myself relieved by the fact that people don't remember the first couple years of their lives. Chances are Kyle likely won't remember the times we forgot to feed him, the clueless looks on our faces during his first illness, or the embarrassing dances we have sometimes engaged in just for a laugh. Nope, once the little guy starts forming memories, he will think of his parents as all-knowledgeable people who only do things that are cool. That's what I'm hoping. If anything, Kyle will likely have no recollection of the fall of 2009, and he should be grateful for that. The fall has been painful for our son, and I don't mean emotionally (though that could change if the Yanks win the World Series). A lot of Kyle's pain has come from those who should be making him feel better: his pediatrician and associates. Considering how many times Kyle is going to be shot this fall alone, you'd think he was a member of the mafia. He received two vaccination shots during his fifteen-month checkup in September, and another shot to fight the flu a couple weeks later. One flu shot apparently isn't good enough for a kid Kyle's age, so we had to go back for another flu shot last Friday. Plus, thanks to the madness caused by a sniffling pig, I will have to schedule Kyle's H1N1 vaccination next week for later this month, and, because pediatricians and government health experts secretly hate children, that vaccine also requires a second shot, which will likely be in December, after he gets a few more shots during his eighteen-month checkup. I fear his shoulder will be sore until he enters the fifth grade. Even before this fall, Kyle was an old pro at shots (as you can see from the picture, taken this summer). The little guy has yet to dread them, as he somehow always forgets that part of the doctor's visit. Every time the shot comes as a surprise. Kyle often still smiles briefly after it happens, but then his brain registers that something horrible just happened (something worse than being forced to eat peas at dinnertime), and that's when the face wrinkles up, the mouth opens wide, the face turns deep red, and the wail breaks the office windows. Five seconds later, the nightmare is over, Kyle realizes the pain's gone and he's back smiling... until it happens again, and there's always a "next time." Perhaps this is why we don't remember the first years of our lives. The mind has the ability to delete some of our most traumatic experiences, which is why Jennifer has already forgotten many elements of childbirth, and I can't remember Super Bowl 42. For a baby, perhaps there's nothing more traumatic than getting shot after shot after shot. It's not easy for me to watch him go through this, either. This onslaught of shots this fall seems like cruel and unusual punishment to me. Then again, I suppose it's better than actually getting the diseases the shots will prevent. At any rate, we'll both be happy when this round is over.